Hint: It happens in the kitchen. Everyone knows that the heart of the home is the kitchen. But what about the heart of the kitchen? If we had to pinpoint a home’s exact center of gravity, there is no doubt it would be the refrigerator. A grounding force for late night snacks and the rest of the day’s meals, the refrigerator is not only the place where good cooking begins, but it’s also where bad habits are born. Sure, your counters may be spotless and your pantry perfectly aligned, but the real truth is that you’re only as organized as your refrigerator. The inner workings of a fridge can tell you all you need to know about a person. Aside from what they like to eat, it offers a revealing look at how they think and operate on a day-to-day basis. How quickly can you find the bare necessities? Are items stacked neatly or haphazardly scattered about? Is the door packed to max capacity? Talk to any dedicated organizer and they’ll tell you that a good day starts with a great fridge. But because stocking your space in a way that makes sense is easier said than done, we asked five experts to share the methods they swear by for organizing the refrigerator. As it turns out, a clutter-free cooler will not only keep you sane, but it will also make you a generally more happy and healthy person. Ahead, we share the pros of a streamlined fridge, plus 11 tips to help you get there. While we won’t claim to have all the secrets to success, we promise that an organized fridge will set you up for a happier and more productive day. When thoughtfully arranged to fit your lifestyle and encourage flow, your refrigerator will actually promote more mindful eating, help you cut down on food costs and more. Have you ever opened your fridge door and stood there with a blank stare only to call the Chinese restaurant down the street five minutes later? Whether you have an overabundance of expired junk or can’t quickly place last night’s leftovers, a poorly composed fridge can alter your eating habits for the worse. “[When the refrigerator is organized] you eat healthier because rather than becoming overwhelmed when opening the door and turning to takeout menus, you can quickly find what you need to make a quick snack or meal,” explains Lisa Ruff, Director of Business Development at NEAT Method. “Organization gives you a better sense of living and mental clarity. 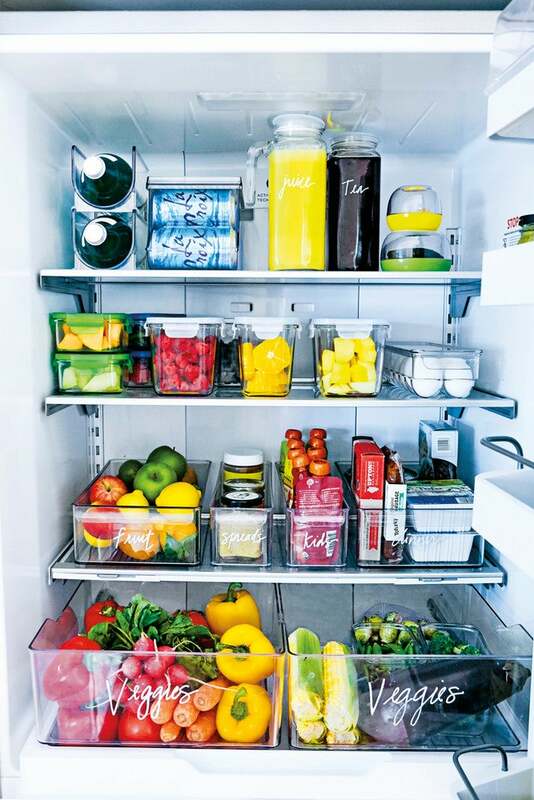 When it comes to an organized fridge, you are more likely to eat healthier and choose better options,” adds Jamie Hord of Horderly Professional Organizing. Being able to see what you have won’t just encourage you to make better choices, it will also save you precious time—especially when you’re rushing out the door in the morning. Once you’ve come up with a system, it’s important that you (and anyone else who also shares this space with you) gets in the habit of returning said staples to their rightful place. Anyone who has ever wasted more than five minutes searching for the ketchup because their roommate thinks it makes more sense stashed in the back than on the door can relate. No matter how neat of a stacker you are, no perfectly-aligned refrigerator can mask the scent of rotten food. When you’re acutely aware of what’s going bad (and what’s not! ), it will prevent you from buying more of the same thing at the store. “When you know exactly what leftovers need to be eaten and when you know exactly what you have instead of running out to go buy it again (instead of everything getting lost in the back), you are saving time, money, frustration, and stress!” says Hord. Want your fridge to look like the above? Before it can become the streamlined oasis we all know it can be, you’ll have to start from scratch. Prep your space by taking everything out, triple-checking expiration dates, and tossing anything that’s gone bad. Although purging might feel tedious, once you see, hold, and rethink what you have, you’ll feel more inclined to find a proper place for all your stuff. And when we say take out everything, we mean everything. “No exceptions. The fridge should look like a barren ghost town when you’re done. With everything visually in front of you, it’s now easier to see what you have, toss leftovers, check expiration dates, and wipe down the shelves,” notes Joanna Teplin, co-founder of The Home Edit. Pro tip: Don’t be afraid to get dirty. “Wipe down the shelves and drawers and use knit gloves to keep your hands cozy!” says organizing pro and former celebrity executive assistant Jen Robin of Life in Jeneral. FYI: Boxes aren’t just for the pantry. Because smaller essentials like condiments, fruits, and snacks can often roll out of place, investing in stackable, glass containers for each type of food group is one visually pleasing way to tidy up your space. “There are many ways to organize a fridge, but we like to create a zone system with containers. Not only does it keep your fridge clean and uncluttered, but a defined space also helps you easily take stock of your items before heading to the grocery store,” says Shearer. Pro tip: Don’t forget to measure! “Measure your fridge to know exactly what size bins you need to maximize the space. Don’t forget about the door and make sure it will still close with the container in there,” explains Hord. While we can all agree that a color-coded fridge makes for serious eye candy, arranging your goods by hue isn’t necessarily an effective way to organize your space, especially if you have little ones rifling through there on the regular. In other words, don’t do it for the ‘gram—do it for your peace of mind! Only after evaluating how you use the fridge can you plan and prioritize what types of food groups belong where. “In the end, you should organize your fridge in a way that best suits you and your family’s lifestyle that way it’s functional for everyone,” explains Hord. “Are you eating leftovers often? Are the kids allowed to help themselves? Color-coding in the fridge is not necessary. We like to color code in an area like the wardrobe because we feel that it’s an easier way to put things back, along with giving you an aesthetic that you never want to mess up! If you want to bring a little color and visually stability into your fridge, consider relegating the rainbow to bins and labels. This is an especially effective way to divvy up space for larger families with different needs. “Each member of the family can have a different colored Tupperware, or the colors can represent dietary needs/restrictions,” suggests Robin. Likewise, consider buying bins with fronts that let you get a little creative with your writing. “Labeling the bins and drawers with a paint marker is a great option. For less permanent categories with labels that need to be changed periodically, we suggest a chalk marker. A labeling system is an easy way to identify the contents so you’re able to quickly find and put away groceries, while also training your husband not to put the lettuce in with the eggs!” jokes Teplin. The biggest mistake pro organizers see people make has to do with upkeep. As with any space in the home, cleaning out your refrigerator isn’t just a once and done type of job. Before you even think about putting away new groceries, take the time to toss away anything that has spoiled or is on the verge of spoiling instead of simply pushing everything to the back and hoping for the best. The refrigerator requires constant editing. Along with your weekly purge, Shearer and Teplin suggest giving this space a head-to-toe cleansing refresh every 2-3 months. When it comes to actually planning out the layout of your fridge, a good general rule of thumb to follow is that items with shorter expiration dates or foods you frequent on a daily basis should be instantly visible. “Leftovers should live in prime real estate so that you know what needs [to be] eaten first. The fridge door temperature is always changing so be sure to only put items here that won’t expire quickly (so not milk! ),” adds Hord. Unlike organizing the closet or pantry, tidying up the fridge has less to do with aesthetics and more to do with safety. Because fruits and vegetables stay fresh longer in low humidity areas, take advantage of your bottom drawers for these items. Relegate condiments and other small staples and sauces to the door as to save your main shelving space for larger essentials, drinks, and leftovers. Pro tip: “Don’t mix your fruits/veggies, and don’t cut produce until you’re ready to use it!” warns Hord. There’s little we love more than a fully-stocked fridge. That said, stuffing your space full of fresh finds from your local harvest is a recipe for a smelly disaster. “Make sure there isn’t an area in your fridge that is too overcrowded. Air needs to circulate throughout the fridge to keep items cool, so when there are piles there are dark spots leading to rotting food,” shares Hord. While organizing a communal refrigerator is a challenge in and of itself, it can be especially stressful to divvy up space when you and your fellow inhabitants aren’t sharing and caring. Labeling is a great way to set boundaries and ensure your breakfast doesn’t go missing. “Use bins and labels! No containers or labels means the fridge is a free for all to put things back anywhere,” suggests Hord. Another easy trick for roommates? Unless you and your housemate follow the same exact diet, avoid confusion by splitting the fridge in half. “Don’t give each other shelves. Instead, give one person the left side and one person the right side, this way you are sticking to food safety,” says Hord. While we think everyone should live by this rule, this is a must if you have a tiny (or, dare we say, a mini) fridge. Things like yogurt, LaCroix, and other boxed goods should all come out of their original packaging before your pack them into your space. This will not only save you space, but it will ultimately make it easier to snag things on the go.